It is a shame that so few of us know how unique and influential Haiti’s role in history has been. After gaining independence in 1804 – following a decade-long war against one of the most powerful empires in the world – Haiti became the first and only nation in history to be established as a result of a successful slave revolt; many of its first political leaders were former slaves. Haiti became the first independent nation of Latin America and the Caribbean, the second independent nation in the entire Western Hemisphere after the United States, and the second republic in the Americas. It produced such prominent military and political figures as Jean-Baptiste Belley (the first black representative in the Western world), Thomas-Alexandre Dumas (the first and highest-ranking black officer in the West), and Toussaint L’Ouverture (brilliant military strategist and along with Dumas the highest-ranking black officer in the West). Moreover, Haiti’s unlikely success against a major power inspired revolutionaries across the hemisphere, who looked to it for both inspiration and military strategy. Many historians regard Haitian independence as a catalyst for independence movements across Latin America, which picked up pace shortly after; indeed, Simon Bolivar, the seminal figure in Latin American independence, received refuge, money, and military support from Haiti. Notably, France’s failure to take back what was then the world’s richest colony contributed to its decision to abandon colonialism in the West and sell the Louisiana Territory to the United States. Needless to say, Haiti’s independence rocked the institution of slavery throughout the Americas, which would unfortunately contribute to its endemic poverty and instability: for obvious reasons, none of the racist or slave-owning nations that dominated that international system at the time wanted to support the first and only successful black republic, especially one born from a slave revolt. Thus, Haiti would remain isolated and periodically preyed upon for much of its history. Two decades after expelling the French, it was forced to pay 150 million gold francs in reparations to French slaveholders in order to receive recognition and end its political and economic isolation. Though the amount was reduced in 1838, Haiti was unable to finish paying off its debt until 1947, leaving the country deeply impoverished — but no less proud and culturally rich. Foreign Policy has another great but sobering slideshow, this time showcasing the plight of Syria’s beleaguered civilians, namely those in its largest and most contested cities, Aleppo. While we’ve heard much about the back-and-forth between the various warring factions, as usual, the fate of those in the middle is somewhat understated (which in some sense is to be expected, given that they’re passive elements in the grand scheme of the war, at least for the time being). Aleppo has been under siege for over nine months — ever since the Free Syrian Army (FSA) stormed the city limits in mid-July. More than 94,000have died throughout Syria, and close to 11,000 have died in Aleppo alone. While the international community dawdles and deliberates, while each side fights for the survival of its reality, civilians here must grapple with the fact that their old lives are gone and their future lives are unknown, and that life must somehow go on between now and then. So people adapt and cope. The blasts of mortars and artillery fire blend into the background, the threat of snipers becomes a reality to grit your teeth through as you walk home, and dark humor seeps into the daily milieu, calming nerves with a white-knuckled laughter that holds tears at bay. Groceries must be bought, money must be made, bellies must be filled, and days must have some sort of meaning. The reality of a civilian in war is that life must be risked in order to live. Day-to-day acts can become small feats of rebellion. Risking sniper fire on the walk to work becomes not only a testament to human resilience and our ability to adapt, but sometimes a statement: You can take my life, but you can’t take my choice to live it. I hope this vicious bloodletting ends soon, and to the benefit of the Syrian people. Unfortunately, that seems unlikely for now: the intractable nature of this grinding war of attrition, as well as the growing sectarianism, makes it difficult to imagine that even a relatively pacified Syria will be stable for long. On December 4th, Russia held elections for the lower house of its legislature, the State Duma (akin to the US’s House of Representatives or the UK’s House of Commons). As typical of the nation’s grimy politics, there was a widespread perception – by domestic and foreign observers alike – that the process was rigged in favor of Prime Minister Vladimir Putin’s United Russia Party, which has become almost inseparable from the state. Despite this fraud, United Russia still received far fewer votes than in previous elections, which suggested that Russians were starting to tire of the corruption and autocracy that has defined Putin’s regime. Although not President, he is widely considered to be the true ruler of Russia, assisted by a network of thugs and lackeys that have previously kept a lid on any criticism or dissent. A few weeks prior to the elections, Putin had even announced his intention to run for President again, leading to some grumbles but little surprise. Tens of thousands of Russians took to the streets in Moscow on Saturday shouting “Putin is a thief” and “Russia without Putin,” forcing the Kremlin to confront a level of public discontent that has not been seen here since Vladimir V. Putin first became president 12 years ago. The demonstration marked what opposition leaders hope will be a watershed moment, ending years of quiet acceptance of the political consolidation Mr. Putin introduced. The leaders understood that for a moment they, not the Kremlin, were dictating the political agenda, and seemed intent on leveraging it, promising to gather an even larger crowd again on Dec. 24. Saturday’s rally served to build their confidence as it united liberals, nationalists and Communists. The event was too large to be edited out of the evening news, which does not ordinarily report on criticism of Mr. Putin And it was accompanied by dozens of smaller rallies across Russia’s nine time zones, with a crowd of 3,000 reported in Tomsk, and 7,000 in St. Petersburg, the police said. Indeed, some sources have claimed the protests to be the largest since the fall of the Soviet Union. Russian police estimate the demonstration’s numbers in Moscow alone are around 25,ooo, with some activists claiming anywhere from 40,000 to 80,000 participants. In Russia’s second city, Saint Petersburg, there are another 10,000 demonstrators, and rallies of various size are taking place in at least 88 more towns and cities throughout the country. These all began as a coordinated and but largely spontaneous response to the electoral fraud and Putin’s consolidation of power, and there seemed to be no clear point other than expressing angst and indignation (as most such grassroots movements begin). This looks like the beginning of a full-fledged political movement, with comparisons to the recent Arab Spring abounding. Police have already arrested over a 1,000 demonstrators in Moscow alone, and Putin has responded by inciting his own pro-government factions to counter-protest in his favor (including the Nashi, a thuggish youth group compared to the Hitler Youth). Interestingly, a smaller number of people are have been detained in connection to these rallies than in previous ones – does that suggest sympathy on part of the police? The domestic media, being largely state controlled, has of course avoided any meaningful mention of this event, not that it’s made much difference: as the Times noted, the savvy use of social media, in conjunction with the sheer scale of the protests, have made such sanctioned ignorance ineffective. Dozens of Russian public figures – from celebrities to activists to politicians – have addressed the crowds and showed support. The Russian diaspora is starting to join in as well. Protesters have already taken on a symbol for their cause, the white ribbon, which is adorning cars, clothes, and other objects, and is the adopted motif of online protest sites (I’ve always said that a symbol is a significant sign of any movement’s maturity, especially since such things are much harder to kill off or suppress). The movement has already made clear that if it’s demands are not met, follow-up protests will be scheduled for December 24th (alluding to their expectation that they’ll probably be broken up before then). Needless to say, I’ll be watching pretty close to see where this is going to go. It’s only been a couple of days, and already things seem to be escalating. Putin, though still pretty popular, has never faced anything on this scale or organization before , so who knows how he’ll react. The government is unlikely to acquiesce, however, and apparently doesn’t take the movement too seriously – so a confrontation of some kind is pretty much inevitable. As a Russophile with a good amount of knowledge on the country (so I’d like to think), I’m in some ways surprised, in others way not. Russia has a history of popular revolts, revolutions, and popular movements, dating back to the first Tsars. At the same time, however, modern Russia has long been seen as a bleak and cynical place, where people became grudgingly complacent with what they felt was politics as usual. In fact, I had just read a recent report on Russia by The Economist, which found high levels of apathy, social exclusion, and pessimism all around, especially about the country’s future (to the extent that a large number of Russians expressed an interest in leaving; this may explain the high rate of brain drain and the low birthrate). So the Russians have surprised everyone in breaking out of their bleak indifference and showing that they do indeed have a stake in their country’s future. While it’s too soon to call this a revolution or a “Russian Spring,” it may hopefully turn out to have some meaningful political impact, however dim the prospects are given the track-record. The negative precedent for positive change hasn’t yet dampened even the famously irreverent Russians. Aleksei Navalny, a popular blogger who has helped mobilize young Russians over the past year, sent an address from the prison where he is serving a 15-day sentence for resisting the police. Mr. Navalny was arrested Monday night after the first of three demonstrations. As many of you probably already know, Muammar Qaddafi – the self-styled the Brother Leader, Guide of the Revolution, and King of Kings- – has been killed. He was one of the longest-ruling despots in over a century, and his oppressive reign was brought to an end in less than 300 days of rebellion – an insurrection that was hardly guaranteed to have succeeded in the first place. Admittedly, like many people, I was beginning to let this recede into the back of my mind. I paid cursory attention to it, but I felt it was pretty much dying down as my over-saturated mind made way for more and newer news. I never did let it go entirely though. I kept revisiting it, hoping it’d turn out for the best. The moment Qaddafi’s forces massacred the peaceful protests that called for more freedom – riding on the wave of similar demonstrations elsewhere in the Arab world – there seemed to be little hope: this would be one of a long list of failed popular protests against entrenched dictators. Experts and laymen agreed that Libya was unlikely to be liberated. Like most tyrannical regimes of the modern world, it seemed a perpetually blighted state. Yet against all odds and the pain of death, the momentum grew. The people resisted. They kept dying but they kept fighting. The next thing the world knew, a wave of defections from both his government and military had strengthened the resolve of the people, and placed Colonel Qaddafi on the unexpected defensive. The people he regarded as rats to be slaughtered (though he simultaneously claimed they really loved him) managed to band together, not only to stop him but to form the closest thing they had to a real government. Dramatically, he met his end in his final stronghold, the small town of Sirte where he was born. Though details are unconfirmed as of this writing, there seems to be enough evidence that he was indeed captured and killed (along with his son, who had acted as a commander). An article in the Huffington Post noted the caution that other media outlets were taking with respect to making any direct claims, though Al-Jazeera produced some graphic but seemingly credible proof of his passing. With his death, the pockets of resistance will likely dissipate, though some holdouts might still carry on the fight (albeit much reduced in number and spirit no doubt). There is some concern that his family, most of whom fled to neighboring states, may foment insurrection and division in revenge: they’ll certainly have learned a lot about how to do that from the patriarch of the family. But it’s hard to say what, if any, influence they may still carry. In any case, the country looks as secure as it could possibly get. It’s hard to believe Qaddafi is truly vanquished. The man held an iron rule over this people for over four decades. He was unparalleled in his erratic behavior, eccentricity, and delusion of grandeur. He saw himself as a brilliant visionary and revolutionary, and to that end supported numerous militant, terrorist, or rebel groups across the world, especially in Africa. He counted many warlords and autocrats as his allies, and often supplied both material resources and advice. But much of that probably doesn’t matter to the beleaguered people of Libya, of whom 30,000 to 40,000 have been killed, and many more wounded (in a country of just 6 million). They suffered under one of the most Orwellian and totalitarian regimes in the world, and barring the admittedly high basic standard of living, they were forced to live a stifling existence devoid of cinemas, public assemblies, and free expression. They defied impossible odds and almost single-handedly took back their country, with the controversial assistance of a previously irrelevant NATO. Not since the fall of Nicolae Ceaușescu of Romania has such a feat been pulled off. I’ll admit to much romanticizing on my part. It is something I cannot help despite my years of IR studies and news addiction, which usually temper my tendency for idealism (though I’d rather fall between the two than on one side or the other). I know this conflict wasn’t as black and white as it seems – nothing involving humans ever is. I also know that despite this well-earned and courageous efforts, the fruits of this hard-fought liberation are still tenuous. If there is one thing that history has taught me, it is that the aftermath of any violent or dramatic change is harder than the process itself. Transitioning to normality is a difficult and contentious task. Almost from the beginning, the leadership of the National Transitional Council, since recognized by 100 governments and most major regional bodies as a legitimate government , have tried to prepare for the inevitable and difficult transition into a functional state. It’s something every revolution faces: the fighting was the easy part, but what comes after is harder. Even our own Founding Fathers went through this process. We had it luckier than our French and Russian counterparts. 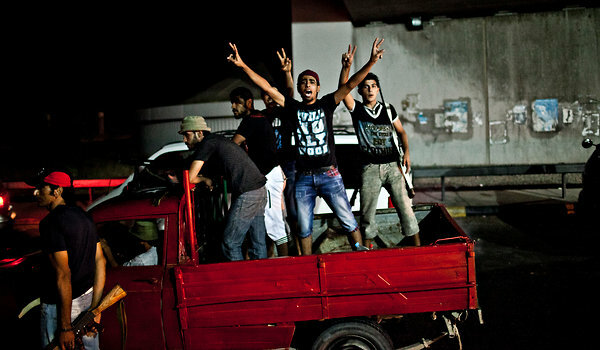 Within Libya, there seems to be a genuine push for a democratic civilian government. But it’s hard to say, given that Libyans have never known anything remotely akin to a functioning government (even by authoritarian standard, Libya lacked any veneer of government, and there is no foundational political apparatus to build upon). Resurgent Islamist elements are present and gaining gound, though they claim to be open to a pluralistic democratic system, and it’s hard to determine their motives and sincerity. Furthermore, the rebels have been functioning as virtually autonomous militias from the start, and there have been noted riffs between themselves as the civilian leadership (which is composed largely of former Qaddafi ministers). They might not be too keen on giving up their weapons to such a government either, given what the last regime put them through. It’ll be a tough task that will require a lot of unity and trust in a land unaccustomed to either, and riven with tribal, regional, and ethnic differences (not to mention a history devoid of much solidarity). But I must hold out hope. The rebels accomplished an amazing thing. They formed a viable, functional government in the midst of a chaotic and often losing war. They kept it together despite noted differences and clashes between them. They formed a unified and relatively effective civil service and military, and managed to take back their country piece by piece through arduous and bloody skirmishes. And now they’re expressing an intention to form a truly democratic state, one which will no doubt be imperfect at first, but still has a chance to grow and thrive. I have my doubts and fears. But I want to believe there might be something positive out of this. There isn’t much else I can do but hope for the best, especially as I look at all the human faces that are celebrating their first taste of freedom in their entire lives. Lastly, and this might seem absurd of me, but I can’t help but feel a bit of sadness when I look at pictures of Qaddafi’s mangled and bloodied face. He was an evil man, no doubt about it, and he arguably deserved what he got, especially as he refused to relent or flee when he had the chance. But I pity evil men. I get sad when I see that this is what has to happen for people to be free. I know that’s just the way the world is, but I can’t help but remain weary of it. I guess that explains why I’m trying hard to be optimistic on behalf of the Libyan people. I hope all this death and suffering amounts to some positive change. It came at quite a toll. I know I’ve accorded a disproportionate amount of attention to Libya, and to a lesser extent the Middle-East in general (especially countries affected by the Arab Spring). I suppose I can’t help my romantic attachment to popular revolutions, especially when they seem as close to Manichean as this one is. Take note, however, that I’m well aware of the ambiguity of such things, and of the complex – even potentially devastating – aftermath that follows. But Qaddafi is clearly evil, and the rebels are as close to being the “good guys” as any ragtag alliance of diverse and enigmatic interests can be. I’ll take that for what it’s worth, and hope for the best, whatever my sobering intuition as an IR and Polisci major. With all that said, here is a brief but captivating slideshow of the aftermath following the rebel takeover of Tripoli, which as of this post remains contested but mostly under the control anti-Qaddafi forces. End of Days: Photos of Qaddafi’s Last Stand. One can only hope it is. The situation is still so precarious. So much could go wrong, and history is full of examples of revolutions being reversed after months of success. Granted, I doubt Qaddafi will ever re-take all of Libya. But it’s still highly probable that the country could be partitioned, or worse still continue in a semi-normal state of steady, intermittent warfare (there are cases of civil wars going on for at least a decade, if not more; pre-secession Sudan was one such example). But looking at all the joy and excitement that is pouring out of the (mostly) liberated capital, I cannot help but maintain my optimism, however guarded it might be. These pictures show the truly human element of the conflict, one that is all to easy to overlook , since, as in most cases, we see conflict either through facts and figures, or through dehumanizing images of fighters behind masks and uniforms. In these photos, I see people’s faces and expressions; I see a liberation force composed of mostly average, young men tearing down symbols of oppression; i see people making way for a new life, after four decades of stagnation, oppression, and isolation. I see a lot of hope. If they’re seizing the potential to create a new and free state, however difficult and distant the prospect, then I see a cause for excitement. The latest news concerning the Battle for Libya confirms that rebel forces have controlled nearly the entire capital city of Tripoli, Qaddafi’s stronghold and central command center. After six months of vicious fighting, in which the rebels were often stalemated and routed, they managed an incredible reversal: not only did the rag-tag group of irregulars manage to overrun the tyrant’s presumably strong defenses and troops, but they did so with considerable speed and coordination. They also managed to capture two of the colonel’s sons, including Seif al-Islam el-Qaddafi, the government’s number two leader. Obviously, Qaddafi hasn’t given up the fight just yet, even given the grim prospects (including three high-profile defections among senior officials this past week alone). His main compound in the city remains out of rebel control, and some fighting between government forces and rebel troops has continued since Tripoli was taken. Despite reports of declining moral, the loyalist forces still seem to be keeping up the fight, and the irreverent despot continues to call on his people to resist the traitors and their Western imperialist allies in NATO. But all this is to be expected from a man sooner willing to slaughter his people like rats than to relinquish power. In my humble opinion, I believe this marks the beginning of the end for Qaddafi, even if it is precariously too soon to tell. I can barely contain my excitement at the prospect that one of the world’s most vile and oppressive regimes may soon be overthrown through a popular uprising – a very difficult feat given the overwhelming odds face (and rare if the subsequent government that follows manages to last and prove itself to be better). I cannot wait to see a Libya that is finally free after decades of brutal and often bizarre rule, a society that was once under more surveillance than almost any other, and in which films, public gatherings and festivals, and any modicum of free expression were forbidden. Of course, I have no delusions about the grim reality of all this: that the rebels, who’ve shown signs of fraying, may break into infighting; that their hold over the capital and the rest of the country (much of which is still out of their hands) may end up being tenuous; that their victory does not guarantee a safe and free Libya; and that there will be a very long road ahead before the nation becomes a truly stable and democratic state – if that ever even comes. We’re still waiting for relatively docile Tunisia and Egypt to progress more definitively, as the excitement over their historic revolutions has been tempered into very cautious optimism. But my hope remains, as I’m sure it does among millions of Libyans that can already feel and enjoy the taste of freedom. They stood up to a terrifying and murderous state and refused to back down even at it’s greatest displays of brutality. What began as a medium-sized protest that was horribly suppressed turned into a sweeping movement of national liberation that transcended – albeit imperfectly – tribal, religious, and political differences. I, like many others, would’ve never thought that movement would keep it’s momentum for this long. To see people who have never known freedom be willing to die for it is a sobering and inspiring experience. I can’t imagine what it must be like, but I’m sure many Syrians are currently enduring the same reflections as they no doubt look to Libya’s progress as a sign of hope. This recent success also raises some interesting questions: the rebels and analysts alike have attributed much of this success to NATO’s operation. Indeed, rebel forces were saved from a potentially devastating flank attack due to NATO intervention, and the intelligence and direction provided by Western nations seems to have paid off (despite several mishaps, such as friendly fire or lack of strategic cohesion). Does this legitimize the concept of military intervention for humanitarian purposed, which has been viewed cynically and skeptically these past few years? Will this make future Western involvement in such matters more acceptable or favorable? What are the implications for Syria, Yemen, or any other future scenario concerning a cause for involvement (although note that the Libyans actually requested such assistance, whereas no other dissidents have done so yet). Personally, I lean to accepting a military intervention of some kind if it is requested of us and if the circumstances are dire enough to warrant it – such as government troops about to brutally put down a peaceful protest. I believe such involvement should be limited in scope, multilateral, legitimized (relatively speaking) through UN resolutions, and clearly outlined in their purpose and parameters. I know that even such a cautious and well-planned approach will still produce problems, and may even be open for self-interested abuse. I’m sure many of my readers will disagree with my stance as well. Though note, in my own defense, that I am not strongly for such a move, nor do I see it is a favorable norm; I am only inclined to accept it as a last resort and under very strict circumstances. Of course, as always, I welcome dissenting views and opinions so long as they are sincere and civil. I can be persuaded by a good argument. In any case, putting some sort of squeeze on noxious regimes seems uncontroversial and effective enough: travel bans, well-targeted sanctions, and freezing the assets of offending officials are all ways to help out. Even diplomatic peer pressure could do it’s part, embarrassing and isolating despots while emboldening their dissenters. Currently, this approach is being applied to Syria, whose situation is not unlike Libya: a decades-old and brutal authoritarian police state facing a belated but stubborn uprising. It remains to be seen if any of this will do much good, or if the Syrian people could endure the horrific toll of their courageous aims long enough to overthrow their oppressors. In either case, there may be a turning point not only for more freedom-fighting Arab citizens, but for foreign policy as well. On that note, I’ll leave you all with some interesting sideshows, courtesy of the New York Times. In some of the latest news regarding the bloodiest episode of the so-called “Arab Spring,” (also known as the Arab Awakening) the Syrian government begins yet another of it’s characteristically brutal operations against dissidents, sending a full fledged military force, including tanks, into the eastern city of Deir al-Zour. This follows another military invasion that commenced just a few days ago, into the city of Hama, a historically restless place that was the site of several vicious massacres from past insurrections (the most recent, which occurred in 1982, came under dictator Hafez al-Assad, the father of the country’s current noxious autocrat, Bashar; it left tens of thousands of people dead, and it is believed that every family in Hama lost someone in the carnage, fueling their present rebellion decades later). The fact that any sort of protests have happened at all is rather miraculous to begin with. The popular protests that swept through the most of the region came later and unexpectedly, which isn’t surprising: Syria has long been one of the most oppressive and rigidly controlled regimes in the world, with a complex and obscure network made up of various security, intelligence, and military agencies all keeping the populace – and one another – in check. Aside from being horrifically effective at suppressing dissent at every turn, this also diminishes the likelihood that the country will encounter the military defections and acts of insubordination that have been crucial to the success of other revolutions in the region (though it’s not to be ruled out completely, as there have been some unconfirmed reports of troops refusing to fire on protesters). Furthermore, the country is so tightly controlled that news of what’s happening there is difficult to come by, even between citizens within. The regime hasn’t just kept a lid on dissent with pure brute force either. Aside from making some hollow promises for reform (which didn’t convince anyone), Assad and his inner circle have long co-opted businessmen some religious elites in order to keep every facet of society under control (the Syrian government is a secular one-party state loosely modeled on socialism, giving the state consider sway in economic and social matters). While the government did loosen things a bit – allowing the proliferation of cell phones and internet connections for example – it made sure to keep political repression firmly in place. (If you want to read a brief profile of the country, click here). The Syrian state has also done a good job of playing on sectarian fears to it’s benefit. The country is quite multicultural by Mideast standards, with a large Kurdish minority in addition to several different religious groups, including the majority Sunni Muslims, and minority Christians, Druze, and Alawite Muslims (the last of which Bashar and much of the ruling class comes from). The regime legitimizes it’s iron rule by trumping up the threat of ethnic and religious violence were it’s heavy hand to be overthrown. Indeed, being Iraq’s neighbor – and receiving many of its refugees – has drilled in the very real fear for most people about the horrors of a revolution given way to chaos and civil war. Needless to say, Bashar has been keen to manipulate this concern even more as of late, and a good number of Syrians, particularly in the middle-class, seem to be conceding to the lesser of two evils as far as they see it. But it’s clear that even with all these obstacles to revolution, the Syrian people have remained steadfast in their demands against the bloated and vicious police state apparatus. The tenacity, courage, and resourcefulness of Syrians remarkable. Unlike in Egypt and Tunisia, the state has not held back: they’ve dispatched snipers, tanks, and machine guns; they’ve tortured, kidnapped, and imprisoned; goons have cut power to cities, dragged people out of their homes at night, and infiltrated communities with informants. Yet despite all this, the people press on. The government shows little sign of fracturing and relenting, and yet the momentum for these protests continues unabated, even though, for all intents and purposes, hope should’ve been lost. As with my previous reflections on Libya, I am left sincerely dumbfounded at the stubborn willpower that humans exercise in their yearn for freedom. I can never imagine what it must be link to face such overwhelming odds, to face certain pain and death, in the name of an ideal I’ve long taken at a given. What is it like to fight such an uphill battle for something? What’s it like to want something so bad as to risk everything and anything, including you own life? As always, I resign myself to the fact that I have the luxury of finding all this to be very alien to me. I’ve never had to fight for anything this badly. I’ve never had to worry about the threat of torture or death against me or my loved ones. I’ve never known what it’s like to be so desperate, so smothered by injustice and oppression, that I’d be willing to break free to die trying. Hopefully, I’ll never have to find out, and that’s thanks to generations of courageous people that came before me and made that sacrifice on my behalf. Needless to say, I’ll be keeping a close watch on events in the region as they unfold, and keep you all updated. Aside from my fascination with the human capacity to affect change even in the most dire of circumstances, I feel the least I could do, given my fortunate circumstances, is to acknowledge and record the bravery and solidarity that is driving their efforts. So many people fight and die for their rights, very basic ones we take for granted, without ever being known for it or ever reaching their goals. I want to see this through the end and hope that they manage to as well. Though I remain cautiously optimistic, it’s a very tough call. If anyone recalls my post from a few weeks ago concerning Pakistan’s reinvention of jazz music, I stated my intention to create a semi-regular miniseries dealing with the cultural and creative scene of countries generally known only for their negative qualities: war, instability, rampant poverty, and so on. To reiterate, my goal is to ensure that we view such nations as more than just miserable and degraded societies, and look past the negative headlines and stereotypes to recognize the beauty, humanity, and normality that persists amid the many problems. For this week, as the title shows, I’d like to focus on Egypt, not necessarily doing too badly by global standards but still a country long bedeviled by poverty, oppression, corruption, and stagnation. As certainly all of you know, Egypt was recently in the midst of an historic revolution that may hopefully bring real progress and better living for it’s courageous people. If anyone is curious about how things are going there and in the rest of the region, given that attention has largely receded since Mubarak’s ouster, the Economist has an excellent and analytical article on the subject (though it’s a bit dated, much of it remains topical). I’ve always been interested in “revolutionary” art. It’s fascinating how the political and social upheaval of a society could be so organically preserved through a burst of creative energy. Art is ultimately, of course, about one’s personal expression – of ideas, thoughts, experiences, and perceptions of the time period – and periods of great change and revolution naturally catalyze a burst of creative expression (especially if they’re leading to – presumably – better times). Thus, there was more to Egypt’s revolution than political change. As in any successful paradigm shift in society, changes permeate throughout every aspect of a civilization: despite the daunting challenges that remain, Egypt is a freer and more optimistic place, and this is being reflected in the blossoming of it’s artistic scene, in everything from revolutionary graffiti to poetry, cinema, and literature (unsurprisingly, political satire, which largely unthinkable, has particularly boomed in popularity). First, Foreign Policy presents an interesting dispatch concerning the country’s more open and creativity-inducing atmosphere. It includes quite a few hyperlinks to some of the projects it references, so I encourage you all to take a look at those. Second, there is a brief but interesting slideshow (also from FP) of some of Egypt’s performance and contemporary art. Admittedly, it could’ve been a bit longer and included more profound artistic pieces, but it too includes some links for those that wish to explore some more. In any case, it’s great to see Egyptians making the most of their new-found and well-earned freedom. It’s pretty much the first time in the country’s 7000 year history that there is almost unbridled freedom of expression, assembly, and speech, and the people will no doubt be making the most of it. As my emphasis in italics notes (and the Economist article I linked to earlier argues) Egypt’s gains are still rather precarious, and it’s future looks ambiguous. With it’s infamously repressive and bureaucratic state apparatus still in place, and the long-dominant military still holding the reigns of power, it remains to be seen how far Egypt will go in spite of almost no history of true democracy. Given the sheer amount of spirit and energy still emanating from it’s vibrant populace, I remain optimistic that positive change will come, albeit gradually. Okay, it's not really art, but the self-expression is there - and poignant. People of Libya! In response to your own will, fulfilling your most heartfelt wishes, answering your incessant demands for change and regeneration … have undertaken the overthrow of the reactionary and corrupt regime, the stench of which has sickened and horrified us all. At a single blow your gallant army has toppled these idols and has destroyed their images … From this day forward, Libya is a free, self-governing republic. That was Muammar Gaddafi, following his coup against the monarchy of Libya on September 1st, 1969. As I witness the events unfolding in Libya, I’m saddened by the thought that Libyans have gone down this road before, and – were they to succeed – could once again tragically end up gaining false freedom. Disturbingly, Ben Ali of Tunisia and Mubarak of Egypt came to power under similar circumstances and with presumably similar noble aims. In fact, many of the world’s most noxious and venal dictators started off as populist warriors who aimed to overthrow the oppressive regimes of the time – only to become the very monsters they claimed to have destroyed. In any case, the situation in Libya has been unfolding very differently from uprisings elsewhere in the Arab world. No other country has yet reached the scale of violence and brutality that has thus far occurred (though Bahrain looked as if it came very close). Indeed, Libya’s protests have now escalated into what I would consider a full-fledged civil war. Several Libyan officials have resigned or defected, and many Libyan soldiers – reportedly including entire military units – have actually joined the ranks of the protesters, along with several tribes from the East and South. The National Conference for the Libyan Opposition, an organization formed in London several years ago by Libyan exiles, has been credited with playing a titular role in fomenting and leading these protests, and is the only organized representative of an otherwise ragtag alliance of numerous different factions all united under one goal: the ousting of Muammar Qaddafi. Otherwise, the opposition – as diverse as that of other protesters elsewhere in the region – lacks a unifying figure or recognizable leader (more so than in Tunisia and Egypt, each of which at least saw a number of prominent figured involved, even if none were predominant). Meanwhile, Libya’s noxious and murderous autocrat, who has stubbornly but unsurprisingly refused to budge, has resorted to using mercenaries to shore up his lack of support among the military (and the country as a whole for that matter). Indeed, Qaddafi’s brutal suppression and inane attempts at rallying supporters strongly hint at his powerlessness and desperation. Even Mubarak and Ben Ali fell rather quickly without having their own state apparatuses turn against them or flee ( although comparing countries, even when they share similar circumstances, is always a difficult endeavor, given the multiple dynamics unique to each of them). The turning tides of the rebellion certainly helps to reinforce the inevitability of his fall. As of the most recent updates, Libyan opposition forces control most of the country, especially the east, where rebel tribes in particular have a strong foothold. I personally did not think the rebels would’ve been so successful, so quickly. I’ve seen and studied my fair share of revolts, and rarely do they go down well or last very long, especially against regimes as oppressive and entrenched as Libya’s. They’ve even managed to repel Qaddafi’s forces during an assault on their strongholds very close to the ruler’s seat of power. That a diverse and leaderless collection of people – among them unemployed youths, the secular and the religious, tribesmen, defecting troops, and other still others – could score such resounding victories against a four-decade-old regime is astounding, and reveals two things: the tenacity, bravery, and discipline of the rebels and the stupidity, corruption, and venality of Qaddafi and his increasingly frail regime. Though long believed to be one of the toughest regimes to crack, and the least likely to have ever changed let alone fallen, Libya now seems poised for a successful revolution. If the momentum continues, there is little doubt that Qaddafi may fall or flee within the coming week (despite what Qaddafi’s own son has to say about the situation). In any case, my views on the events are ambivalent. On the one hand, I am inspired and taken aback by the courage and will of the people of Libya, who’ve defied all odds as they give one of the most intractable regimes in the world a run for it’s money. As I remarked somewhat romantically in my previous post concerning the unrest in the greater Arab world, I find it gratifying and enlightening to see a people long considered untouched by the values of freedom facing certain death in the name of it. Hundreds and perhaps thousands of Libyans are said to have perished in just these past few days, and more will likely lose their lives as the fighting intensifies. On the other hand, Libya’s revolution is also taking a far more grimmer tone than any other so far. Aside from the virtual state of civil war that it is enduring, there are reports of much brutality on both sides. Mercenaries and loyalists have terrorized the population with attacks against civilians, households, and mosques. Secret prisons have reportedly been uncovered by rebels, as have mass graves that likely date back to the horrific acts of state terrorism under Qaddafi’s rule. Troops refusing to crackdown on rebels have been tortured or executed. Meanwhile, several rebel factions have taken to lynching police officers and other security personnel, and killing mercenaries after they’ve been taken prisoner. It’s a grim reminder that even the most seemingly romantic events, whatever their idealized aims, are as tainted by the worst of human nature as they are inspired by it’s greatest machinations. While I’m tempted to be excited about the seeming wave of democratization that is sweeping the region, I can’t help but feel both guilty and cautious; the former for allowing myself to get caught up in the romance of revolution without considering the moral ambiguity and bloody cost; and the latter for realizing that things are far from certain to improve from here on out. The quote from the beginning of this post cruelly sums up the precedent of past fights for freedom. The bitter infighting that has characterized Libya’s rebellion may brew a lot of bad blood that could mire the country in instability and polarization for some time, even if Qaddafi were to fall. And the status of Egypt and Tunisia, the initial “victories” of the freedom fighters, remain ambiguous and concerning. Ultimately, there is no telling whether these revolutions will match those of Eastern Europe circa 1989, or resemble a long and tragic history of false positives that have bedeviled the region one too many times. For what it’s worth, I still remain hopeful.